Following the M56 from England into Wales, we descend into a land of rolling hills, ancient castles, quaint villages and rugged landscapes shrouded in mist. 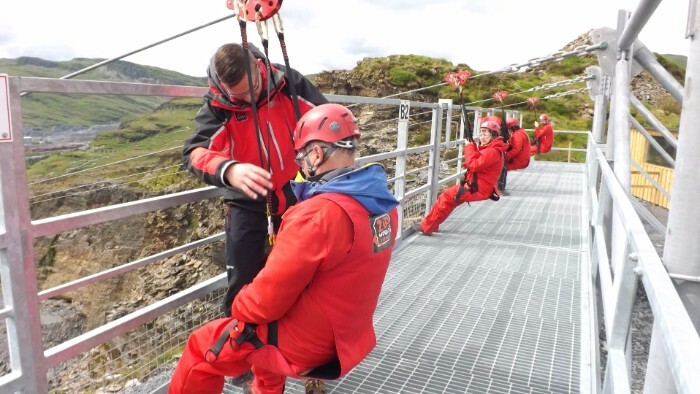 Hidden in the heart of Snowdonia, in a valley resembling Middle Earth, surrounded by pine forests and glistening lakes, you will find Zipworld and the longest zipwire in Europe. Descending from a plateau, with far-reaching views of glorious countryside, you stumble upon a hulking hole carved out of the mountainside. This is the gateway to a system of mines, where children as young as six, used to toil for endless hours, blasting dynamite into the rocks to extract slate. These days, rather than the boom of explosives, you will be greeted by screams of joy. Whilst the Slate Caverns are not the most photogenic place on earth, I think they might just be the most exciting!! This adrenaline fuelled, hive of activity is home to underground trampolines, mega zip wires and underground caverns. 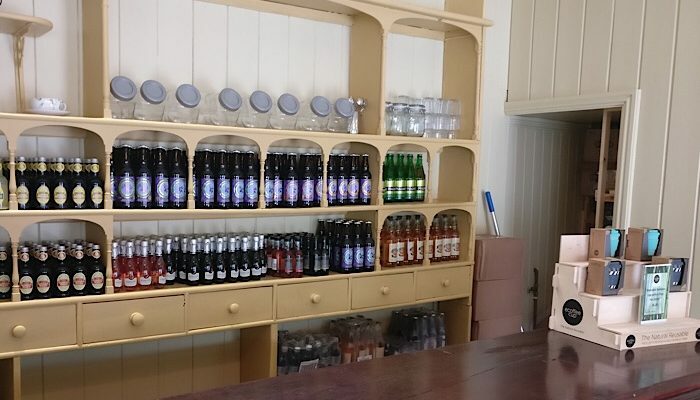 It’s a bustling place, with a Victorian tea shop, pub, 19th century mine, shop and adventure centre. We are here today to try two experiences, Titan and the Caverns, and we have no idea what to expect. 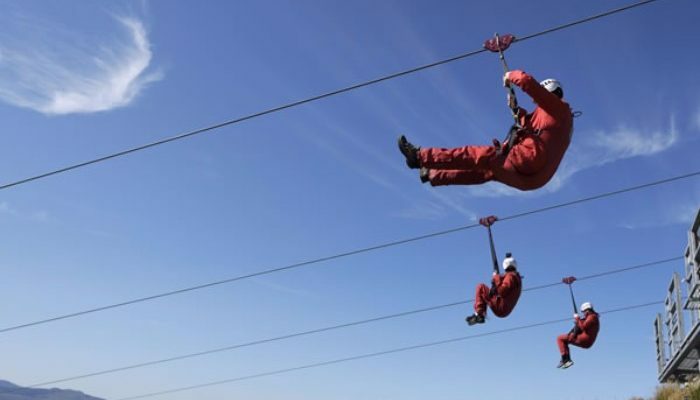 The longest zipwire in Europe is a series of three zipwires hurtling down the Snowdonian mountainside. A minibus ferries guests up the mountain road, to the top of a nearby peak, and magnificent far-reaching views of the Welsh countryside, bathed in mist and the odd ray of sunshine. The Alpha zipwire drops 890 metres from majestic views of the surrounding lakes. With top speeds of 65 miles per hour, you will feel the wind jostling your swing seat, tears streaming down your face and the buzz of adrenaline as your feet leave the ground. My legs are quivering and I’m feeling a little sick as I stand on top of the mountain peering into the abyss. There’s no time to get cold feet however, as I’m ushered into position, strapped in and the gates rumble open. The exuberant staff shout 1, 2, 3 and incredibly I let go. My feet lift and I’m off, whooshing through the air, an involuntary scream echoing through the valley. I sit back and relax into my seat, admiring the landscape, as Jason whizzes past me. Laughing with joy, I swing and sway at the behest of the wind whistling through the valley. But in no time at all, I lurch into the break pad at the bottom and am released from the harness by a chirpy member of staff. A short walk, past a picturesque lake, with glorious sunshine warming our skin, we arrive at Bravo. 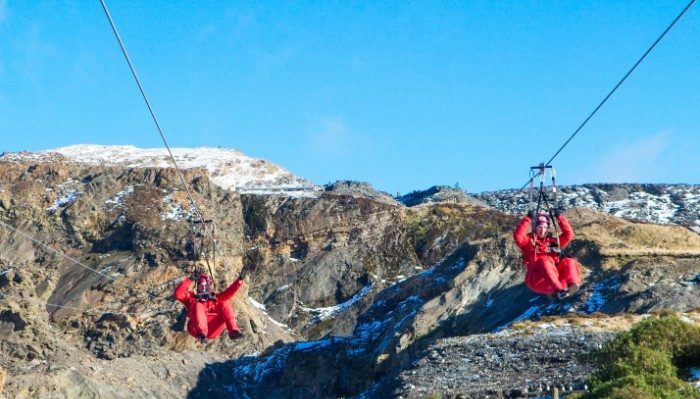 This zipwire plunges vertically over a cavernous quarry. 630 metres of whooping with Jason once again racing ahead. 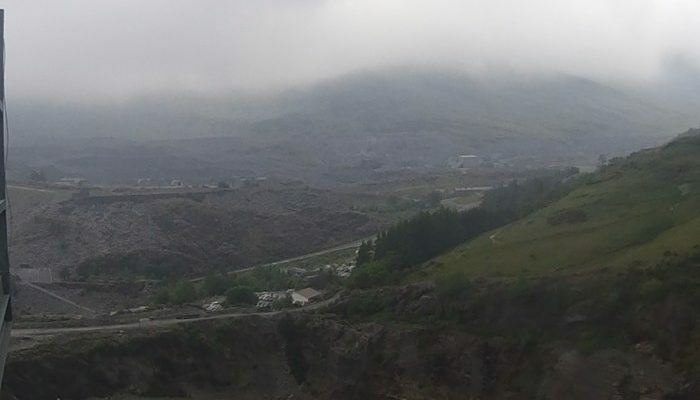 Reaching speeds of up to 75 mph, we come to an abrupt halt in no time, and a short clamber up the hillside takes us to our last zipwire and views over the slate village. It’s not hard to imagine how this would have been a bustling little village in the 19th century, with the old village pub still taking pride of place in the centre. Charlie is the baby of the wires at just 450 metres and maximum speeds of 57 mph. Homeward bound, you fly over the café and come to a rest at the base of the mountain, as a few drops of rain start to fall! Titan is a great family outing. It’s adrenaline inducing without being fear filled. You are unlikely to lose your dinner on the mountain, or find it so terrifying you return to base in humiliating shame. You will likely find it an exhilarating experience, a novel way to see the Welsh countryside and a fabulous family bonding experience. If you are in any way concerned that it may not be worth the money (£50 per person with discounts for groups of four), don’t be. This is one attraction worth the drive. The staff are well-trained, it’s incredibly well organised, the manager roams the grounds making guests feel welcome (nice touch, Ian!) and I highly recommend it. It takes between sixty to ninety minutes so you really feel as though it is a proper day out. There are also other awesome activities at two other nearby locations, so you could come back and make a weekend of it. I will definitely be back! Disclaimer: Thank you so much to Zipwire for hosting Jason and I on both Titan and the Caverns experience. I’m still buzzing 24 hours later. It may be relief at being alive but I am pretty sure I had a blast! What’s It Like To Go Skydiving In The UK? Ah this looks like so much fun! I’m not far from Wales – should make more of an effort to go exploring! AWESOME!! The Welsh countryside is an incredible spot to go ziplining – some of the most stunning landscapes in Europe, and it’s always a thrill to soar above incredible scenery like a bird :D! I always think of Costa Rica when I think of the ziplining capitol of the world, but perhaps Europe has some even better experiences :D! I really enjoy ziplining. I’ve gone in a few different places around the world. It’s fun to zip through the trees and see the landscape passing below.. I’m definitely going to check this one out, now that we’re living so close by. What an amazing experience. 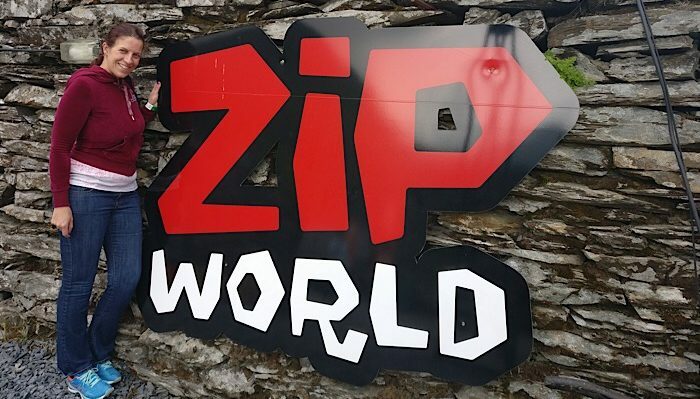 I certainly must visit the Zip World. I am a little bit afraid of heights and bungee jumping but zip lining is something I can manage. The scenery from up there is breathtaking. These ziplines looks awesome! We haven’t been ziplining in probably about 8 years now, but we used to do a zipline and adventure course every time we went to the Caribbean. Now that I know this one exists, we’ll have to check it out! I did one in Honduras which was really cool as it was through the forest. This one was totally different as it was more length and speed. It is great to have both experiences though. I definitely would like to do some more. My husband has never been on a zipwire so this looks like the perfect place to try one out! Do you need to dress up very warm as it looks quite cold? Did you scream at all 😉 The underground trampolines sound like fun too. It wasn’t cold, just grey but suspect in winter you would need warm clothes. I love zip lining! Would love to give it a try here, especially since it’s the longest in Europe–how cool! The views look fantastic too and it sounds like an awesome adventure! I’d love to do it! The best zipping I’ve done so far was in the Amazon jungle, but no matter how long or short I love it – it’s so exciting to watch the world from above! OOh I bet ziplining in the Amazon was incredible. 65 miles an hour, ziplining through misty mountains sounds like a great idea for adventure seekers! Should recommend this to a friend I know…she would definitely give it a shot! Wow! What an adventure! I’ve got such fear of heights, but always try to combat that! Guess I should try ziplining one day! haha.. I love the view here and just for that, a bit of an adrenaline dose would be amazing. I have done fair amount of ziplining earlier but of late, have ceased enjoying it. Maybe now it will be fun! How does it work? Does the staff member open the door for you and then you start going? I am a big fan of adrenaline activities like this! This looks so much fun and I bet you had a great time! Definitely going to add this to my list! 50 GBP doesn’t sound bad at all for such an experience! I think my whole heart would drop into my stomach on this, but I 100% want to try it out when I get a chance to visit Wales. I can’t even imagine going as fast as a car on a highway on a zipline! I did the caverns too and was terrified! I am happy to read a place which previously was a hub of child employment got replaced by something positive. I can feel the Adrenalin gush that you must have felt while zipping. I cannot wait to try it for myself! That looks like so much fun! I don’t know why I never think of doing zip-lines while I’m traveling. I don’t know if I could get my husband on that’s super tall! This looks AMAZING! I would love to do this. I’m sad I’m so far away. I do try and do zip lines whenever I can over here in Central America. I’m adding this to my European bucket list!